The Patriots on Wednesday signed veteran tight end Austin Seferian-Jenkins to a very team-friendly one-year contract that increases their depth at the tight end position. The news was first reported by Field Yates of ESPN. The deal with the Patriots is a very low risk and a possible very high return. Seferian-Jenkins signed for the veteran minimum andincludes a $50,000 signing bonus, with an additional $40,000 in future bonuses. Seferian-Jenkins was considered an athletic freak when he entered the NFL but has been unable to stay healthy. But with a minimum contract and little in bonus money, he is betting on himself to have a good year working with Tom Brady and Josh McDaniels and can cash in next season at the age of 27. While he doesn’t possess the kind of speed to threaten the seams like Rob Gronkowski, he can (when healthy) find open spots on the field and find a way to get open. He’s not a replacement for Gronk, that just isn’t fair to Seferian-Jenkins to even suggest it. Nobody is. He can, however, become a productive member of the Patriots passing game. Something to keep in mind when talking about Jenkins is that he hasn’t exactly played with an elite quarterback. Take a look at the QBs he’s caught passes from… Blake Bortles, Josh McCown, and Jameis Winston. There is no reason to not believe that he should be much more productive working with Tom Brady. But is he going to be the Patriots #1 tight end? No, but the Patriots just picked up a possibly very productive #2 with several other players vying for the #3 spot on the roster. The #1 tight end for the team is still to come via the upcoming 2019 NFL Draft. He just increased the depth at the position and will be given every chance to carve out a very big role in this offense. The risk/reward pendulum, due to his contract is tilted firmly in the Patriots side. Listen to our Patriots 4th and 2 podcasts on several apps as writers Russ Goldman, Derek Havens and I from PatsFans.com discuss the latest Patriots news and game analysis. 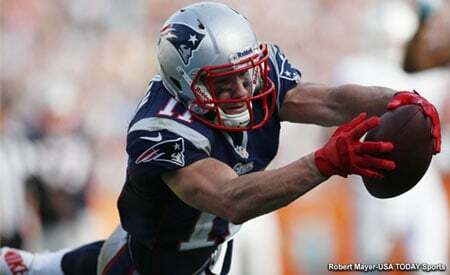 This entry was posted in 2019 Patriots offseason, NFL Commentary, NFL News, Patriots Commentary, Patriots News and tagged 2019 NFL Draft, Austin Serferian-Jenkins, free agency, Jacksonville Jaguars, New England Patriots, New York Jets, Patriots tight ends, Rob Gronkowski, Tampa Bay Bucs, Tom Brady on April 11, 2019 by Steve Balestrieri.